The Lunar Year is a time for abundance. 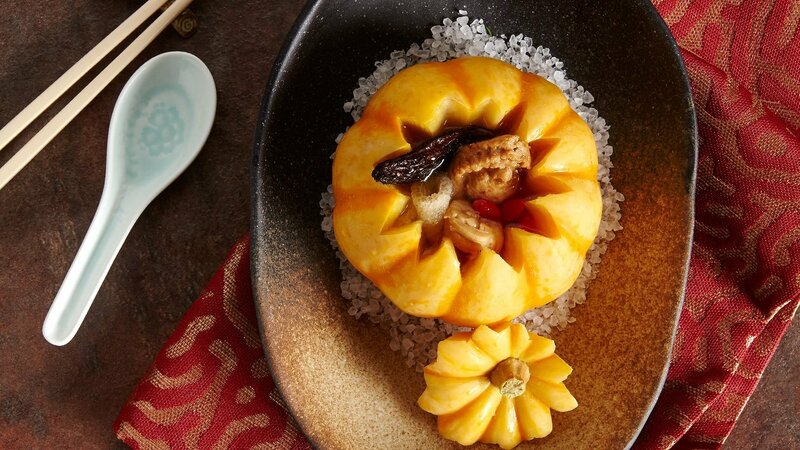 Give it whole new meaning with this hearty and heavenly pumpkin bowl of goodness that’s overflowing with fruits and other Chinese New Year delights that diners know and love. Mix the marination well, set aside. Cut a lid off the small pumpkin, remove seeds to make a bowl. Steam for 20mins till slightly cooked, ensure that the pumpkin is not overcooked. Set aside. Add the pork collar minced meat to the squid paste, add marinade and mix well into a smooth paste. Mould the paste into abalone-shaped balls. Steam for 8-10mins till cooked, set aside. Bring water to boil in a pot and add the seasonings. Season till you get the desired taste, maintain heat and set aside. Steam all the ingredients and place them into the pumpkin bowl. Steam pumpkin bowl for 5mins. Add warm soup into pumpkin bowl and serve.